Taping one of our new Bill Dance Saltwater shows recently took us up the east coast to Virginia Beach, Virginia. I knew when we arrived that 30-degree night and began checking into the Best Western there that we were at the right place for some exciting Striper fishing the next day. Fishermen from Baltimore, New York, Washington, Philadelphia and Atlanta were all there for the same reason. The buzz word was “the bite is on!” I was so pumped up I bet I didn’t sleep a total of three hours. Well, all the talk was right on. We met our buddy Mike Standing who owns Waterman’s Sportfishing Guide Service at 7 the next morning. 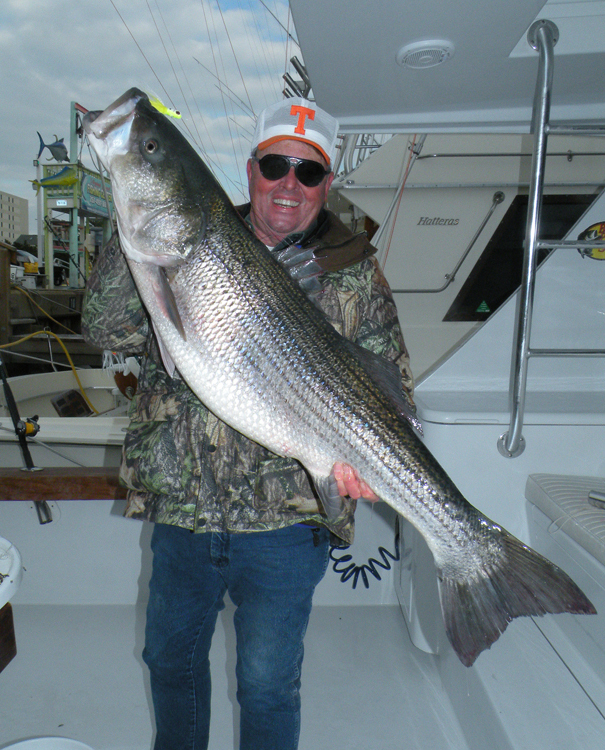 By noon we had caught and released 25 stripers—a 45 pounder, two 30s, a 38, and several in the 20 to 30 pound class. This show will air on the Outdoor Channel beginning Friday night, March 20th at 10:30 Eastern time, 9:30 Central. Hey, we were just gettin’ started. The next day, we did about the same, only the fish ran bigger. I caught my biggest – a 47 pounder! We also videoed this for another show which also included a couple of 45 pounders and several over 35 pounds. You know, I can write about this trip, tell you about it, show you pictures of it, and video it, but for you to really appreciate it, you’ve gotta actually live it. And guess what! You can! All you gotta do is call our ole friend Mike at 757-288-9051 or check out his website at www.watermansportfishing.com. It’s an experience you’ll never forget, I promise.